Green shoots force their way through the debris of winter storms. Sunlight freckles on green growth in the ditches. And here in the westernmost mainland parish in Ireland, the St Patrick's Day celebrations crackle with energy and excitement, amalgamating the triumph of the Christian saint over the druids with the triumph of the Good Goddess over darkness, and the joyous return of life to the land. However, St. Patrick's personal association with the colour green and the dear little shamrock isn't altogether straightforward. In fact, wearing red, not green, for St. Patrick's day has a time-honoured heritage in Ireland. It was recorded in 1681 that 'the poorer people' in Ireland wore shamrock on St. Patrick's Day. But others, we're told, wore crosses - and the first reference, in 1628, describes Irish soldiers wearing St. Patrick's Day crosses made of red ribbon 'after their country manner'. As soon as the Irish State was set up, it became fashionable to insist that the diagonal red cross on a white ground, known as St. Patrick's cross, was a despised colonial invention of the 1800s. But the arms of Trinity College, Dublin, known to have been used at least as early as 1612, include St. Patrick's diagonal red cross on a white ground, representing Ireland. ... it's worth remembering how recently green became Ireland's national colour. 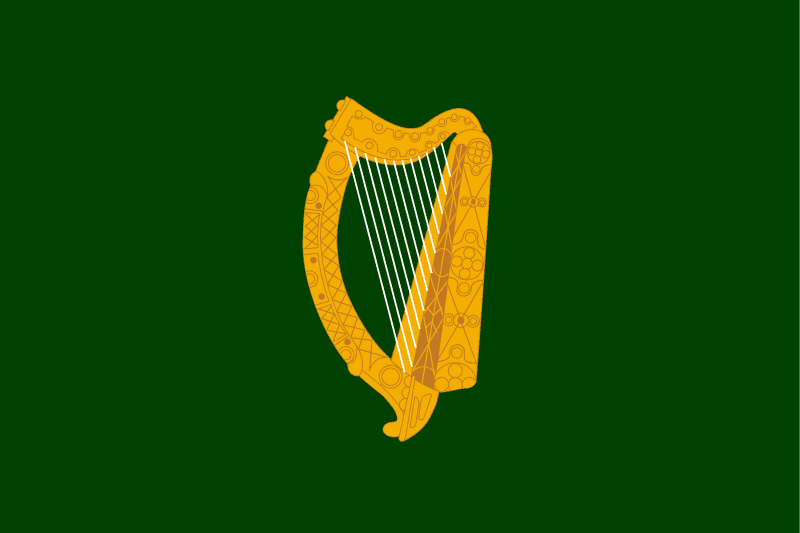 It wasn't till the eighteenth century that waving a green flag - with or without a gold harp - became a recognised way to define yourself as Irish. As late as 1798, contemporary commentators were writing about the revolutionaries' green flags 'adopted ... in imitation of the shamrock' as if the colour choice was unexpected. In fact, a flag with a harp on a green field had been flown at the masthead of his frigate by Owen Roe O'Neill more than a century before that, in 1642. But the idea that the the wearing of the green embodies the essence of Irishness is essentially Victorian, and the story that St. Patrick himself carried a green banner is a romantic nineteenth century invention. I may adopt it myself at this year's parade in Ballyferriter. A majestic yellow lion on green satin sounds wonderful! Happy St. Pat's to you! !